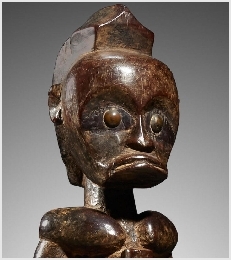 Standing reliquary wood figure which would be placed on top of a Byeri box. Carved with scarification in front with circular metal tacks as eyes. Nice patina throughout. Fitted on a black contemporary wooden base. 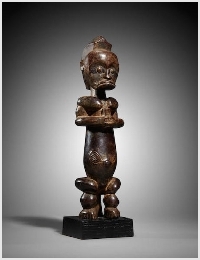 Encompasses Cameroon and Equatorial Guinea.